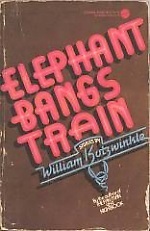 When I was about 17 or 18 a teacher introduced me to a book of short stories called Elephant Bangs Train. It was a collection of some of the most unusually written short stories, similar in vein to what Richard Brautigan was producing at the time. The author was William Kotzwinkle and I wanted to read more by him. There wasn’t much at the time except a novel called Fan Man which perpetuated his crazy, compelling story telling. He went on to write more novels, including, the award-winning Dr. Rat. He wrote screenplays and he novelized screenplays—most notably E.T. The Extraterrestrial. He became a favorite author of mine but I always went back to his short stories. They reminded me that the publishing world is eclectic and there is no particular mold you have to fit into. And that vignettes can be compelling. Years later, after I had added many more authors and books to my favorites lists, walking through a local gallery/local crafts store I saw a book displayed with his name on the cover. 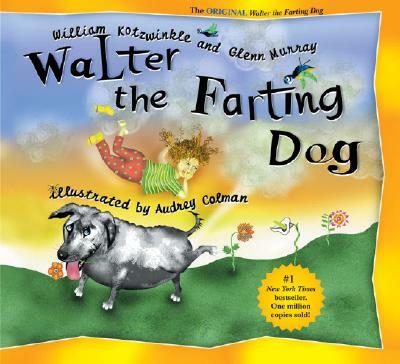 It was a kids’ book, co-authored with a Glenn Murray, which was cool, but it was called Walter the Farting Dog. My first instinct was dismissal. How could this personally revered author stoop to this? There had been a wave of fart and poop books at that time and they just rubbed me the wrong way. Prejudicially, because I had read few if any of them. But this was William Kotzwinkle, a favorite writer from my youth, so I took a look. The art was jarring at first, the story wasn’t bad. And after reading it, I really kinda liked it. And Walter became his own little industry with 5 or 6 books and collateral products. 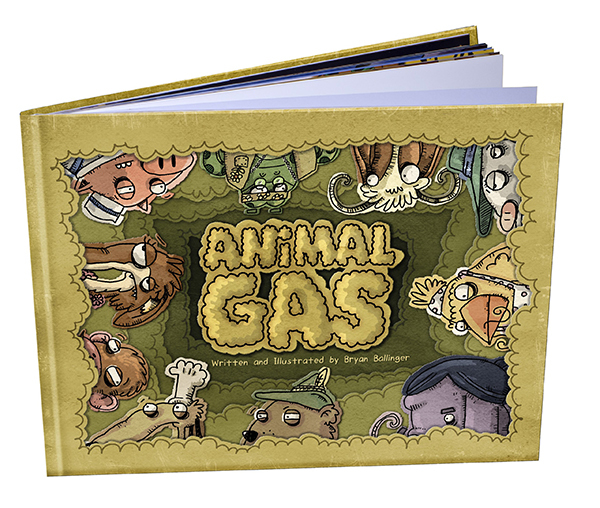 Maybe there are good fart or poop or burp books out there even if they made me uncomfortable. Are they award-winners? I don’t know, but they are entertaining and kids seem to love them. 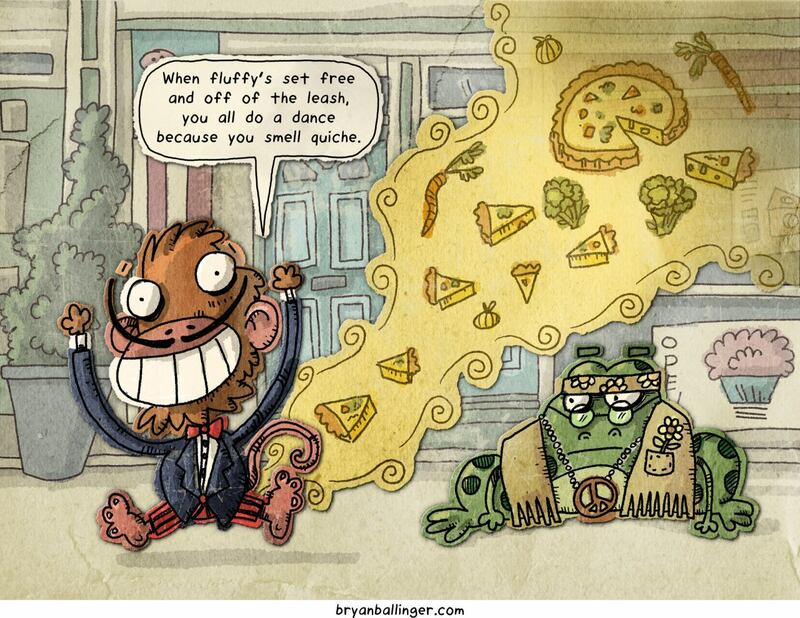 written and illustrated by Bryan Ballinger. Bryan is an illustrator, animator, writer, teacher and a bunch of other things. Full disclosure, Bryan is also an online friend of mine. 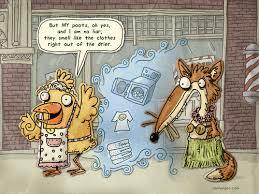 I love his art work and his sense of humor. Several years ago when he showed me bits and pieces of this book in it’s pre-digested stage, I laughed. It was and is funny. Bryan decided to self-publish it and did so through Kickstarter a couple years ago. But it was no mere self-publishing job, this one would be a Scratch and Sniff adventure! He researched what it would take and went through, I’m sure, the expensive process of having a very limited run of books made including scratch and sniff patches throughout. And I am the lucky owner of one. It is a well-made book using substantial page stock and top of the line printing. I’m still wary of bathroom humor and do not gravitate towards it. But if it is done well and is engaging, like Animal Gas, it works! 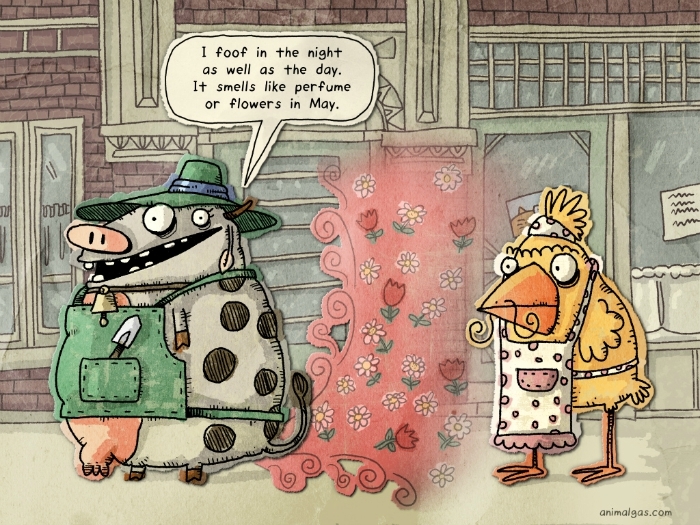 I hope Bryan sells as many copies of his book as Kotzwinkle has sold of Walter the Farting Dog—well over one million. What fun to read about this book on a gray, wintry day! Hmm . . . as a teacher, I never would have read these books aloud in my class. But I didn’t mind at all if my students read them! P.S. 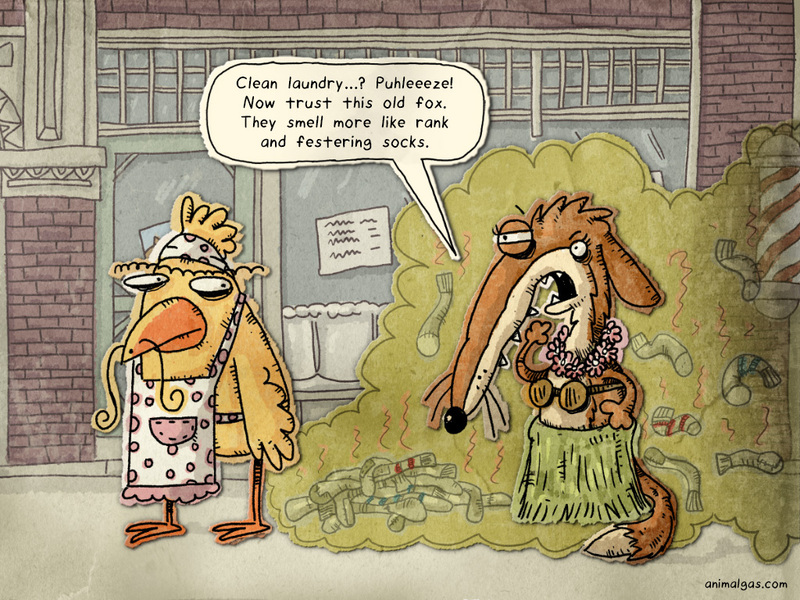 Gassy Jack is a character in Stanley’s Party. I watched the trailer. One could say this is an ‘educational’ book! Very clever, indeed. My library doesn’t have it. Love those books! AND, (true confession time) my family has always exploited fart humor! Probably because “fart” was a dirty word when I was growing up! To my mind, the word “fart” and other oft-forbidden terms are words that children secretly, gleefully discover and then share among themselves.. Hee, hee! It’s a way for them to separate themselves from us boring, uber grownups. They find it empowering! But, I believe, children need to discover and share these words in their own good time, their own circles–they do not need us giving them a knowing wink and displaying our coolness by pointing them out to them. As a child, I never expected “disrespectful” ideas from grownups–and when it did happen, I was always shocked and disappointed. And as a children’s librarian, I never did feel that scatology was something I needed to inflict on my young audience in the storytime room. My daughter bought the Walter book when she was young. She’s 25 now and was going through the attic and came across that book. It was one she wanted to keep!